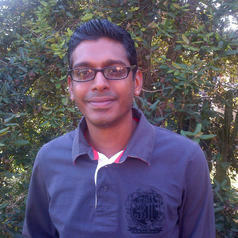 Sershen Naidoo is presently a lecturer in Plant Ecophysiology at the University of KwaZulu-Natal (UKZN, South Africa). He has a BSC in Biology, a BSc Honours in Plant Physiology, an MSc in Seed Biology and a PhD in Cryobiology and Plant Physiology from UKZN. He is a previous co-chair of the South African Young Academy of Sciences and champions a number of projects related to food and water security . His involvement in numerous community-based urban agriculture projects and ongoing commitment to the NGO-sector across Africa has seen him earn numerous accolades (including a Clinton Democracy Fellowship). His research pedigree is evidenced by >50 conference presentations, >20 research articles in ISI-rated journals and his appointment to various strategic national and international committees within the conservation/ higher education sector. He is presently actively involved in research projects ranging from Plant Germplasm Conservation, Plant Responses to Climate Change, Water and Air Pollution, Urban Conservation/ Ecology/ Greening, Renewable Energy, and supervises/ co-supervises over 15 post-graduate students.